1. Preheat the oven to 180˚C, gas mark 4. Season the salmon fi llets, place on a baking sheet and cook in the oven for 20 minutes. 2. Cook the pasta according to pack instructions, adding the peas 2 minutes before the end of cooking. Drain and reserve a cup of the cooking liquid. 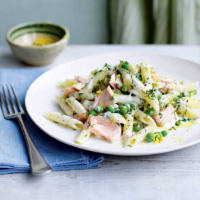 Return the pasta and peas to the pan with the crème fraîche, lemon juice, half the zest and most of the dill. Season and stir through 3 tbsp of the cooking water until creamy. 3. Flake the salmon and gently stir through the pasta. Scatter with the remaining dill and lemon zest and serve immediately.